Brand new and completely revamped, Alpinestars introduces the Valparaiso 2 Drystar Jacket just in time for the Tech Touring Line to shine with tricky weather conditions on the horizon. 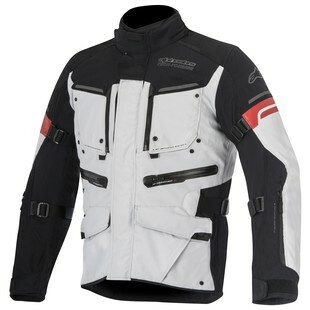 The Alpinestars Valparaiso 2 Drystar Jacket is the next evolution of an old staple in the Alpinestars Touring catalog, and they pulled out all the stops when designing this jacket making it a true successor. The high impact areas see the use of 600D Pylamid Fabric instead of 500D Nylon, and CE certified shoulder and elbow armor are included, while provisions exist for back and chest armor. Comfort has been improved with two adjustment straps on the arms instead of one baggy strap, the use of a soft neoprene topped collar, and better-positioned zippers to enhance airflow into and out of the jacket. A-Stars has even redesigned the chest vents to open upwards instead of folding away, and the back sees the use of two vertical vents to increase airflow and the longevity of the Valparaiso 2 Jacket. Another welcome touch is the Drystar waterproof liner will also serve as a destination liner, allowing riders make full use of everything the Valparaiso 2 has to offer on and off the bike. Inevitably, this jacket is going to be a go- to in many touring and adventure rider's closets' and rightly so. It is a true step forward from the original Valparaiso in terms of features, fit, and finish, and will have many riders excited to jump on their bike no matter what Mother Nature is throwing down.